Problems with the glow bar system.....You may even see the orange "glow plug" (called a hot surface igniter) glowing orange and so assume that it's OK. Not necessarily!! You have to measure the current/amp drawn by the igniter and compare it to this repair sheet before you can say it's OK or not. The gas valve has a bi-metal that open when a certain amount of current flows through it to heat it up. The igniter is wired in series with the gas valve. As the igniter gets older or weaker, it's resistance increases to the point where not enough current is flowing to the gas valve bimetal to open it up. As a result, the gas valve never opens up. BTW, a common symptom of the early stages of this problem is erratic temperature control in the oven due to delayed firing of the bake burner while cooking. The hot surface igniter will not come on - check igniter with a ohm meter, you should have continuity through the glow bar, the glow bar can also crack = new igniter time. The glow bar comes on but the main burner will not light - you should have an amp probe to check properly, but often this is a hot surface igniter problem. The hot surface igniter often looses it's ability to get hot enough to open the gas safety valve. The safety valve can fail, but most times it is just a bad hot surface igniter. The hot surface igniter can also quit part way through cooking , in other words the oven may cycle a couple of times and then it just sits there with the red glow from the igniter. 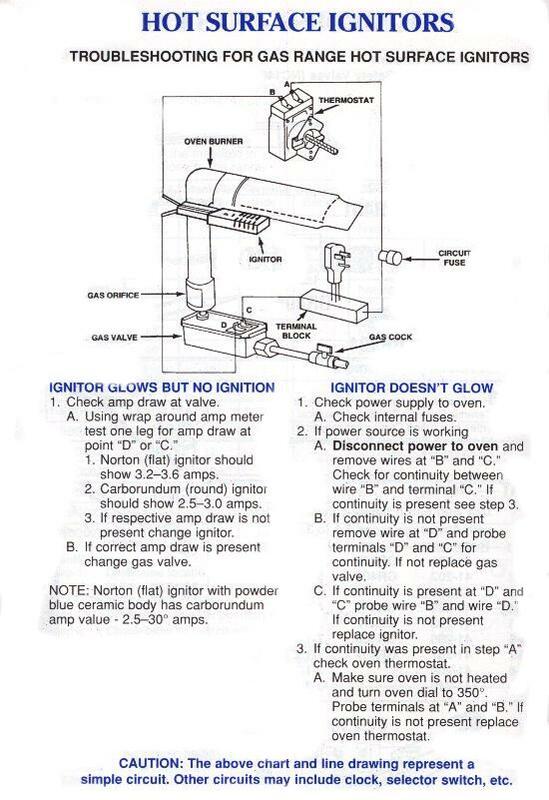 See this service sheet for the proper way and amp readings for the hot surface igniter system. Hot surface igniters do weaken and will eventually generate less heat than they normally could. When this happens they can still allow marginally correct current to flow to the oven gas valve for it to open but not get quite hot enough to ignite the gas burner immediately. When this happens, gas released into the oven can sometimes build up to the point where when finally ignited, the amount of gas lit can cause a small explosion inside the oven or cause an odor of gas with out the oven working. Yes, your glow bar igniter can glow orange-red and still be bad!! How a common gas valve works - click here. Gas range help: If you are having problems with the oven, the first thing to do is figure out if you have a pilot light system or a glow bar system. Problems with the pilot light system.....The flame has gone out, re-light the pilot. The pilot flame will not light - possible oven control is not sending gas for the pilot light. The pilot light works but no main burner ignition - possible pilot assembly is dirty and the pilot flame is too small, safety valve and thermocouple is faulty, the bulb from the safety valve is out of position and the pilot flame is not touching the thermocouple bulb. Some ranges use a standing pilot light ( smallflame is on all the time ) while others use an spark ignition to light the pilot light flame and the pilot light flame heats up the thermocouple bulb to allow the main gas to flow through the oven burner. The pilot flame may not be hot enough, usually because the flame is yellow instead of pure blue or is too small. The cause for this is usually a dirty pilot assembly. The pilot assembly would either need to be cleaned or replaced. The thermocouple bulb may not be positioned properly in the flame. You can't heat the bulb properly if it's not in the pilot flame! The thermocouple bulb needs to be in the upper third of a pure blue pilot flame--that's the hottest part of the flame. The thermocouple itself may be burned out. It happens. It's a internal part of the gas valve so, no, you can't just change the thermocouple bulb separate from the gas valve. But when you turn on the oven or the thermostat calls for heat, the pilot flame gets bigger and jumps down so it can heat up the thermocouple bulb. This extra gas to increase the pilot flame size comes from the thermostat. If the pilot flame jumps upwards or just gets bigger, but doesn't shoot down, then you need to replace the pilot assembly. If the pilot flame size does not increase or jump down when turning on the oven thermostat, then the problem is the thermostat not sending enough gas to the pilot assembly. It's also possible that the pilot gas supply tube has a hole in it somewhere. There could be a problem with the switch in the thermostat. You can confirm this by doing a simple continuity test of the thermostat contacts. If you don't read zero ohms when you turn the switch on, replace the thermostat. The spark module could be bad. You'll need to measure the voltage at the oven terminals of the spark module when you turn on the oven. If you get 120v but no spark, it's probably a bad spark module. Replace it. Could be a bad spark wire or broken electrode.